Here in north Florida, we’re fortunate enough to enjoy a climate that, like other parts of Florida, allows us to grow beautiful fruit trees. Other states may have their mountains and rolling valleys, but they don’t have picturesque beaches and palm trees aplenty. Though Florida is well-known for producing some of the country’s very best oranges (think Florida’s Natural Orange Juice), it’s fairly common for folks to grow their own citrus fruits and other types of fruits. At Gainesville Lawnscaping, we support these fruity Floridian endeavors, and do our best to advise our customers on how to best take care of their valued trees. Want to learn more about properly maintaining your fruit trees and how to grow the best citrus fruits possible? Keep reading below, or feel free to head on over to our FAQ page. Let’s get started! Choosing the appropriate rootstock is essential to a happy and healthy Florida citrus tree. For the north and northeastern Florida areas, three types of rootstock are typically recommended for a citrus tree that’s resilient to frost, disease, and other potential threats: Trifoliate, Swingle (hybrid rootstock), and Flying Dragon. Above all else, simply make sure that your citrus tree is grafted on rootstock that’s fit for our climate. It’s possible for citrus to grow in the shade, but citrus trees really thrive in direct sunlight. That’s fairly common knowledge, of course, but you don’t want to forget this when it comes to where you’ll be placing your tree. It’s highly recommended that you shouldn’t plant a citrus tree in an area where water easily accumulates and saturates the soil beneath it, as this can cause fairly rapid root decay. 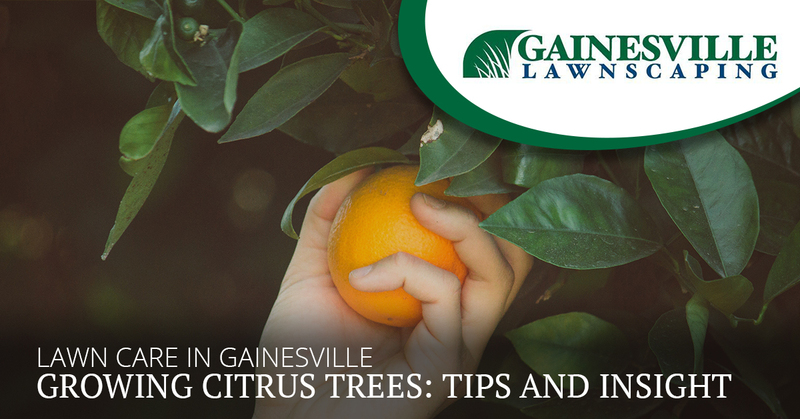 Keep your citrus tree and your grass separated; it’s well understood by many with a green thumb that grass and trees don’t mix very well (despite what you’d otherwise think). In the same vein, never use lawn fertilizer to fertilize your citrus tree. Additionally, do not use a weed and feed product around a citrus tree of any age — especially a youngling. A gentle, slow-release fertilizer suitable for citrus trees is a safe bet, but make sure not to fertilize your citrus tree from the months of October through February. Interestingly enough, you don’t need to prune your citrus tree in order to stimulate fruit production. If you see any dead limbs, feel free to remove them. Near harvest time, it’s perfectly fine to keep your tree fairly short in order to make access to the fruit easier. Prime pruning time is generally after the potential frost season is over, usually in March. From your home to your business, Gainesville Lawnscaping has the tools, knowledge, services, and experience necessary to keep things looking absolutely pristine. Ready to set up recurring residential and commercial lawn care services? So are we! Contact Gainesville Lawnscaping today.